Layettes, which include an infant tee shirt, body suit, bib, booties and a cap, are provided to University Medical Center, Women’s Resource Medical Centers and Nellis Air Force Base new mothers. They are delivered monthly for University Medical Center’s Baby Steps prenatal program which provides health care and classes for new mothers. Upon completion of the program the mothers are eligible for “goodies”, including the Assistance League of Las Vegas layettes. 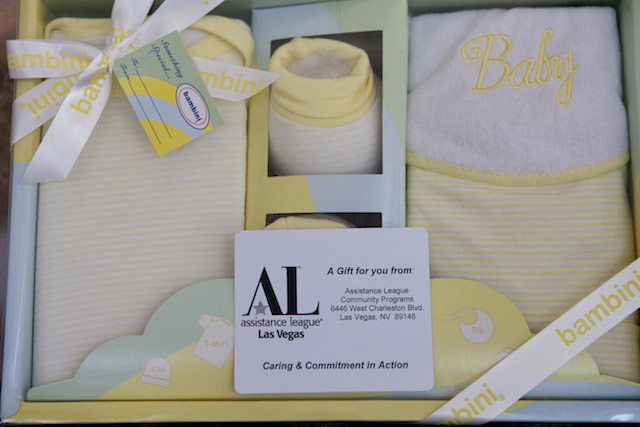 Layettes are delivered as needed to the Nellis Family Advocacy Program at Nellis Air Force Base for new mothers. Hand-made blankets, sweaters and hats are donated for this program by chapter and community volunteers. These items when received are also taken to University Medical Center, Women’s Resource Medical Centers and Nellis Air Force Base.